“Inlaid” appliqué consists in tracing the same pattern on two different fabrics, say a gold cloth and a crimson velvet; then cutting both out carefully, and inlaying the gold flowers into the crimson velvet ground, and the crimson flowers into the gold ground. This kind of work may be seen constantly in Italian rooms of the seventeenth century, and the alternate breadths of crimson and gold give a very fine effect as of pilasters, and in general are enriched by a valance applied at the top, and a plain border at the bottom. The inlaid part is sewn down with thread, and covered with cord or couchings of floss silk. Sometimes narrow ribbons or fine strips of cut silk are stitched over the edges to keep them down flat. “Onlaid appliqué” is done by cutting out the pattern in one or many coloured materials, and laying it down on an intact ground of another material. Parts are often shaded with a brush, high lights and details worked in with stitches of silk, and sometimes whole flowers or figures are embroidered, cut out, and couched [Pg 55] down. This sort of work is extremely amusing, and gives scope to much play of fancy and ingenuity, and when artistically composed it is sometimes very beautiful. Another style of “onlaid appliqué” is only worked in solid outlines, laid down in ribbon or cord, sometimes in both. This was much in vogue in the time of Queen Anne, and for a hundred years after. The ribbon, very soft and thick, sometimes figured, sometimes plain, was manufactured with a stout thread on each side, which could be drawn, and so regulate the ribbon and enable it to follow the flow of the pattern. The German, French, and Italians often enriched this style of work with a flower, embroidered and applied thrown in here and there. Very small fringes also were introduced into the pattern, or arabesqued. [Pg 56] “Cut work,” like the appellation “Feather stitch,” has a totally different meaning when it is given to white embroidery, and it has nothing to do with appliqué, but takes its name from the fact that the pattern is mostly cut or punched out, and then edged with button-hole or plain overlaid stitch. In working appliqué it is best, although not absolutely necessary, to have the design traced on the material to be used as a ground, which must then be framed as for ordinary embroidery. A copy of the design must be made on tracing-paper, and the outlines carefully pricked out with a needle or pin, laying the paper on several folds of flannel or cloth for greater convenience in pricking. A pad, made of a long strip of flannel about four inches wide, rolled very tightly, must be made ready, and some pounce made of about equal quantities of finely powdered charcoal and pipe-clay. The leaf or scroll which is wanted for the work must now be selected, and the pricked design laid face downwards on the fabric which is to be applied. The flannel pad must be dipped in the pounce and rubbed well into the outlines of the pricked design, which must be held firmly in its place with the left hand. On lifting the tracing-paper, the design will be found to be marked out on the material distinctly enough for it to be cut out with a sharp pair of scissors. The pounce can afterwards be dusted off. The leaf or scroll having been thus cut out must be fastened in its place on the design with small pins, and then carefully sewn down. The edges are then finished off by stitches of embroidery or by a couching line (see page 39). 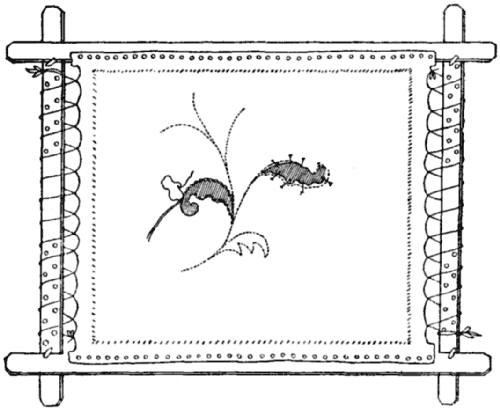 The stems are frequently worked in with stem [Pg 57] stitching or couching, and the leaves enriched by large veinings of crewel or silk work, or in conventional designs, with some of the many varieties of herringboning. Gold Embroidery on velvet or satin grounds requires to be worked on a strong even linen, and then cut out and applied in the same manner as ordinary appliqué. Where a particularly rich and raised effect is required any embroidery may be treated in this manner. It is of course more troublesome, but quite repays the labour spent upon it by the increased beauty of the work. The transfer of old embroideries on to a new ground is usually done by appliqué, although we have already described a better process at page 39. In transferring old needlework it is necessary to cut away the ground close to the edge of the embroidery. It is then placed on the new material, which has been previously framed, and the outline tacked down. The best way of finishing is then to work in the edges with silks dyed exactly to match the colours in the old work. If properly done, it is impossible to discover which are old and which new stitches, and only by examining the back, that the work has been transferred at all. We used the words “dyed to match” advisedly, as it is impossible otherwise to procure new silks which will correspond with the old. Embroidery transferred in this manner is as good as it was in its first days, and in many cases is much better, for time often has the same mellowing and beautifying effect in embroideries as in paintings. A less expensive, but also a much less charming, [Pg 58] method is to edge the old embroidery after applying it to the new ground with a cord or line of couching. With this treatment it is, however, always easy to perceive that the work has been transferred. A piece of thin cotton or linen fabric is stretched tightly on to a board with tacks or drawing-pins. It is then covered smoothly, and completely, with paste. The wrong side of the velvet, satin, serge, or whatever is to be used in the work, is then pressed firmly down on the pasted surface with the hands, and then left to dry. In giving the foregoing account of the most typical stitches, we hope we have succeeded in showing the principle on which each should be worked. They form the basis of all embroidery, and their numerous modifications cannot be fully discussed in the limit we have prescribed to ourselves. It is sufficient to observe that the instruction we have tried to impart is that which it is absolutely necessary for the needleworker to master thoroughly before she attempts to cope with the artistic element of her work. That it is a creative art is undoubted, for no two pieces of embroidery are alike unless executed by the same hand, and from the same design. For the advanced artist there is a store of instruction in the fine collection at South Kensington, which, seen by the light of Dr. Rock’s invaluable “Catalogue of Textile Fabrics,” is an education in itself, of which the ethnological as well as the artistic interest cannot be over-estimated, and it is within the reach of all who can find time to bestow upon it. Always avoid using an iron to embroidery. It flattens the work, and is apt to injure the colour. For embroidery on linen, unless very badly done, it will be found quite sufficient to stretch the work as tightly as possible with white tacks or drawing-pins on a clean board, and damp it evenly with a sponge. Leave it until quite dry, and then unfasten it, and, if necessary, comb out the fringe. If it is new work, it should not be fringed until after it has been stretched. For crewel work on cloth or serge, it is sometimes necessary to rub a little shoemaker’s paste on to the back of the embroidery, while it is tightly stretched. When pasting can be avoided, it is always better to do without it; but it serves to steady the work in some cases, and makes it wear better. Unless it is absolutely necessary, it is better not to paste the back of screen panels, whatever may be the materials on which they are worked; but more especially satin or velvet, as it interferes with the straining of the work by the cabinet-maker. We give a recipe for Embroidery Paste, which is said to be excellent:—Three and a half spoonfuls of flour, and as much powdered resin as will lie on a half-penny. Mix these well and smoothly with half a pint of water, and pour it into an iron saucepan. Put in one teaspoonful of essence of cloves, and go on stirring till it [Pg 60] boils. Let it boil for five minutes, and turn it into a gallipot to cool. N.B.—Let the gallipot have in it a muslin bag: the water can then be drained out from time to time, and the paste will be much better. Good crewels will always wash or clean without injury; but the cheap and inferior worsteds will not do so. Ordinary crewel work on linen may be washed at home, by plunging it into a lather made by water in which bran has been boiled, or even with simple soap-suds, so long as no soda or washing-powder is used. It should be carefully rinsed without wringing, and hung up to dry. When almost dry, it may be stretched out with drawing-pins on a board, and will not require ironing. Embroidery on cloth or serge may often be cleaned with benzoline, applied with a piece of clean flannel; but in any case, where a piece of work is much soiled, or in the case of fine d’oyleys, it is safer to send it to the cleaner’s. Messrs. Pullar and Son, Perth Dye Works, are very successful in cleaning all kinds of embroidery without injuring it. In many cases it may be well dyed—the silk in which the design is worked always showing a different shade from the ground.